The people who resided in the desert state known as Utah had an arid hit in the year of 1977. The Color Country Spectrum reported on February 27, 1977, that Gov. Scott Matteson had encouraged residents to prepare for the drought and urged the state to act as a team. Matheson asked Utah cities to help find a solution for the water shortage, particularly during the dry summer months. Although the entire state experienced a water shortage that year, southern Utah — and the city of St. George — was particularly affected by the drought. The city’s residents had saved water because of the shortage. The Water and Power Board enacted strict rules regarding water usage. Even so, the dryness still came. St. George’s main water source was from natural springs and wells, but with the dry weather, the sunny city worried whether there would be enough water to last through summer. People feared that irrigation and agriculture would be hit the hardest. The Color Country Spectrum reported on February 24 that with the growth of the city and community it gave a great reason to also have the water usage shortened. The water development was worked on and was combined with the sewer project. 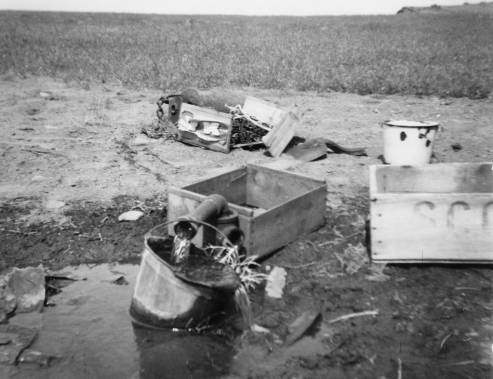 Fred Rendell, author of Making the Desert Bloom, wrote that “The Water and Power board were on a constant alert which made them ration the water.” (Rendell, 225) With the water disappearing, it had left residents with fear of water depletion. The almost waterless city had to find a solution to the shortage. In fact, because of the dry weather, many residents had lost their jobs. But, the drought gave residents a new task. The Color Country Spectrum reported on March 4 that locals were asked to help in any way that they could. Ideas included limiting water usage, restricting the use of sprinklers, using water only for essential needs, and finding better sources of water. The residents would determine how much water they would have been able to use. This had made the residents look harder for water sources. The best idea was to go to local ponds, reservoirs, and lakes. Drilling ensued and five wells ultimately were constructed to feed “two giant underground storage tanks.” The Color Country Spectrum reported on March 4 that putting the tank in Snow Canyon Park created a water supply for residents of St. George. Constant reminders to save and use water wisely were difficult for residents of St. George. However, the city pulled through, in part due to hard work and a team effort. This feeling of coming together helped to create an atmosphere of achievement and a sense that their city in southern Utah would remain. “Snow Canyon Arch … was source of life for Ivins,” St. George, Utah, Color Country Spectrum, February 20, 1977, 1. “Drought program to aid West, Midwest,” Color Country Spectrum, February 23, 1977, 1. “Washington copes with growing pains,” Color Country Spectrum, February 24, 1977, 1. “Utah Faces Worst Drought,” Color Country Spectrum, February 27, 1977, 2. “Southern Utah Prepares for water shortage,” Color Country Spectrum, February 27, 1977, 1. “Weather Prompts Scare,” Color Country Spectrum, March 4, 1977, 1. “Water Supply Deteriorates,” Color Country Spectrum, March 8, 1977, 3. Bill Cooper,“Drought Affects Wildlife,” Color Country Spectrum, April 3, 1977, 2. “Changing Water Rate System Encouraged,” Color Country Spectrum, April 10, 1977, 1. “About Snow Canyon State Park,” Utah State Parks and Recreation. Rendell, Fred. “Drought Turns Eyes Toward Snow Canyon,” in Making the Desert Bloom, republished by the City of St. George. The Wenner family lived on Fremont Island from 1886-1891, the only family to ever call Fremont Island home. Uriah James and Kate Wenner are forever sealed into the history of Fremont Island, the Great Salt Lake and the state of Utah. A very important contributor to the history of Fremont Island is Howard Stansbury, who developed the first geographical outline of the Great Salt Lake. Stansbury had a meeting with Brigham Young, the pioneer of Mormonism and the migration to Utah, to develop the survey outline of the Great Salt Lake. Of the meeting, Stansbury declared, “ The impression was that a survey was to be made of their country in the same manner that other public lands are surveyed, for the purpose of dividing it into townships and sections.” (Madsen, 152) Stansbury knew of Fremont’s discovery and “in honor of him who first set foot upon its shore,” Stansbury revived the territory’s true name, Fremont Island. (Miller, 220-21) Using the created surveys, he determined that the island would excel as a territory for sheep herding. A water spring on Fremont Island. Used by permission, Utah State Historical Society, all rights reserved. The story of the Wenners begins with their arrival in Salt Lake City in 1880. Uriah James Wenner launched a small law office, which transformed the family into some of Salt Lake City’s most successful and recognizable citizens. Eli A. Smith, a judge, was relieved of his duties due to a violation of the Edmunds Act of 1882. Salt Lake City Governor Eli H. Murray proclaimed in the September 9, 1882, Deseret News, “Know ye, that by virtue of the anthority in me vested, I, Eli H. Murray, Governor of said Territory, do hereby appoint” Wenner to fill the vacancy. The article reported that Murray had announced several new positions, one of which was probate judge of Salt Lake County. Uriah James Wenner had been tapped to serve on the bench. Wenner, a non-Mormon, accepted the position. The family’s residence on Fremont Island. Used by permission, Utah State Historical Society, all rights reserved. The Wenner family had been able to explore and rediscover life. The family was able to appreciate the natural beauties of both the island and of living in peace and solitude. These were the main highlights of their time spent on Fremont. Living in solitude forced the family to try new things. In “A True Story” of island life, Kate Wenner described an episode where she milked a cow: “His (Uriah Wenner) greatest surprise on the Island was my bucket of milk, and I am sure it was the cow’s greatest surprise too.” (Noble, 231) When the Wenner family was missing an ingredient or supply, they would simply say it was not needed, that it was an attempt at something new. That seemed to be the reality of island living, only the true necessities mattered, it was an eternal happiness for the Wenner family. Unfortunately, the joyous times did not last. As the years went by, Uriah Wenner had begun losing his battle with tuberculosis. He stopped working, he needed the assistance of a walking cane, and when he was bedridden he was forced to call upon his wife for all his needs. Wenner died peacefully in 1891, lying in his bed on his beloved home, his island Fremont. According to Kate Wenner’s story, her husband’s final words to her were, “I love you, love the children.” (Noble, 232) With those words he rested for the final time. In a stunned fear, she used the island’s only distress signal with the mainland. Kate set off multiple fires on the highest hill, but it took several days until she was able to see a fire lit on the mainland shore. This signal meant that help was on its way. Uriah Wenner’s gravesite on Fremont Island. 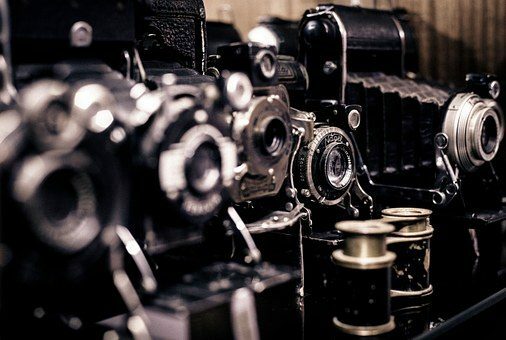 Used by permission, Utah State Historical Society, all rights reserved. Andrew Butterfield is a senior at The University of Utah. He is majoring in mass communication and minoring in sociology. Everett L. Cooley, “Great Salt Lake — Fremont Island p.13,” Utah State Historical Society, Mountain West Digital Library. Everett L. Cooley, “Wenner, Uriah J. 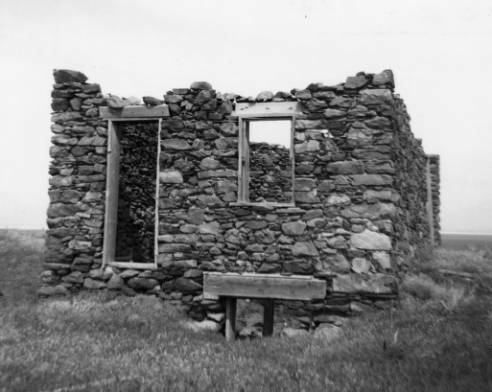 — Residence P.2,” Utah State Historical Society, Mountain West Digital Library. Shipler Commercial Photographers, “Wenner, U. J. 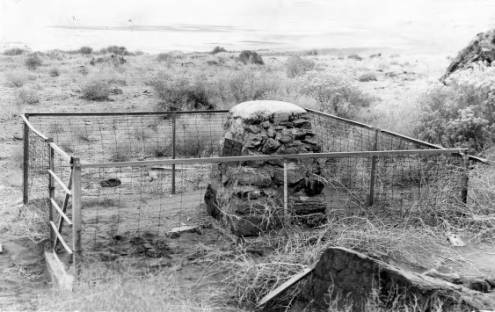 — Grave P.1,” Utah State Historical Society, Mountain West Digital Library. Kate Y. Noble, “A Great Adventure on Great Salt Lake: A True Story,” Utah Historical Quarterly 33, no. 3 (July 1965): 218-236. “Faithful After Death,” The Dalles (Oregon) Daily Chronicle, November 21, 1891, 4. J.H.K., “U.J. Wenner,” Ogden (Utah) Standard Examiner, October 4, 1891, 6. “A Heroic Woman,” Ogden Standard Examiner, September 30, 1891, 1. “The Alleged Reception,” Deseret News, July 23, 1884, 8. “Proclamation of the Governor,” Deseret News, September 9, 1882, 5. Arave, Lynn. “Fremont Island is no disappointment,” Deseret News, April 16, 2009. Eckman, Anne M. and David H. Miller. “Seymour Miller’s Account of an Early Sheep Operation on Fremont Island,” Utah Historical Quarterly 56, no. 2 (Spring 1988): 163-165. Madsen, Brigham D. “Exploring the Great Salt Lake: The Stansbury Expedition of 1849-50,” Utah Historical Quarterly 56, no. 2 (Spring 1988): 148-159. Photo courtesy of the Special Collections Department, J. Willard Marriott Library, The University of Utah. Zion National Park is one of the United States’ natural hidden treasures and would not be the utopia that it is today without the efforts put forth by the Civilian Conservation Corps. Also known as the CCC, this program was created to help sustain jobs and to give opportunity to the young unemployed men of the United States as well as to improve public lands during the Great Depression of the 1930s. Signed as a national park in 1919, Zion is one of Utah’s best-kept secrets and the first national park of the state. Mukuntuweap Canyon, which was the original name for Zion Canyon, was the “cool habitat that became the home for the first people of Utah … around 11,000 B.C.,” writes David Oswald in his book, A Journey Through Mukuntuweap: The History of Zion National Park. Located in the southeast corner of the state, Zion is a spectacular Park that can only be accessed by one double-lane state road, which is closed to public traffic in the summer months. Instead, visitors ride park-run busses that help keep the park almost emission free, clean and pristine. One thing that is more than likely forgotten by the visitors who come to the park is the history and how it came to be. Zion not only has a rich history of Native American culture but also an opulent history that involves the growth sustainability of the United States as a country. President Franklin Delano Roosevelt established the CCC on March 31, 1933. The organization was created to fight against soil erosion and declining timber resources by utilizing unemployed young men from large urban areas across the country. It is said that “the speed with which the plan moved through proposal, authorization, implementation and operation was a miracle of cooperation among all branches and agencies of the federal government. It was a mobilization of men, material and transportation on a scale never before known in time of peace.” (CCC Legacy) After establishment the program boomed, and held great public support with hundreds of thousands of young workingmen enrolling every day. 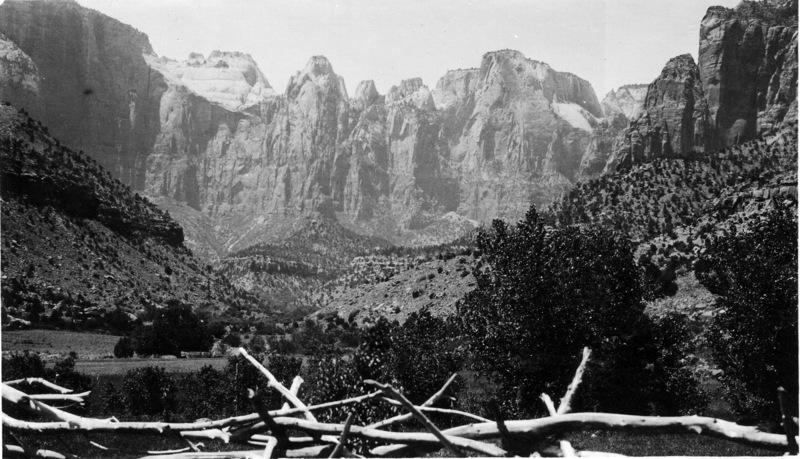 Zion Canyon, Zion Lodge, circa 1930. Photo courtesy of the Special Collections Department, J. Willard Marriott Library, The University of Utah. For payment, the men were given somewhere to sleep, food to eat and clothing to wear, and made about $30 a month. Most of them kept $5 and the remaining $25 was sent home to their families. (Oswald) Topics regarding the “hearty Army meals and menus,” the clean hospitality that was given to the workers, as well as the hefty budget that was dedicated to running the camps can be seen in an article from the Kane County Standard on February 15, 1935. The reporter writes, “When the American boy of today goes into the woods he takes his appetite with him no less than his older brother took and appetite to war in other days.” Men gained an average of “9 ¾ pounds” after working in the camps for only three months, according to an article form the Iron County Record published on March 8, 1934. This information was noteworthy news because of the Great Depression in which the rest of the country was rationing food and supplies. Working for the CCC was not only beneficial to the country, but also for the workingmen who got the opportunity to enroll. The men spent all week completing backbreaking jobs around the park, including building the 1.1-mile tunnel through a solid mountain. But they still had the energy to spend time taking hikes throughout the park on the weekends. One example of this is from the diary of Belden Lewis, a CCC enrollee who worked in the park from 1934-1935. These places that Belden mentions are some of the most popular hikes in the Park and today are very frequently traveled trails, which were created by the CCC. “The main roads and trails of the canyon were built, including the trail to The Narrows by the men of the CCC.” (Larson) The men worked extremely hard on creating the beautiful park that we see today, but also had the amazing opportunities to explore the park themselves. The CCC did wonders for Zion and almost the entire park holds the history of this hard time for the United States. When the Civilian Conservation Corps’ work in Zion was ended in 1942, many of the men were able to transition from structured CCC life to the structured life of a military man as they fought in World War II. The CCC was essential in the creation of Zion and without their work it is hard to say what would have became of the canyon, if anything. Today, more than 2.5 million curious patrons visit Zion National Park annually, and many hope to catch a glimpse of the sun rising on the Towers of the Virgin. In the summer months, busy sightseers crowd the paths like sidewalks in New York City during rush hour, and walk upon trails created by the CCC. Zion National Park holds nothing less than the jaw-dropping landscapes and awe-inspiring cliff faces one would assume. There is nothing like it in the world and without experiencing this veiled sandstone treasure with your own eyes, you cannot say that you have seen the earth’s natural true beauty. Amy D. Wilde is a senior at The University of Utah. She is majoring in mass communication and minoring in international studies. “Openings Announced in Zion CCC,” Garfield County News, September 9, 1941, 1. “Supt. Patraw Praises CCC,” Kane County Standard on February 15, 1935, 1. “Men of CCC Camp in Good Condition,” Iron County Record, March 8, 1934. 1. 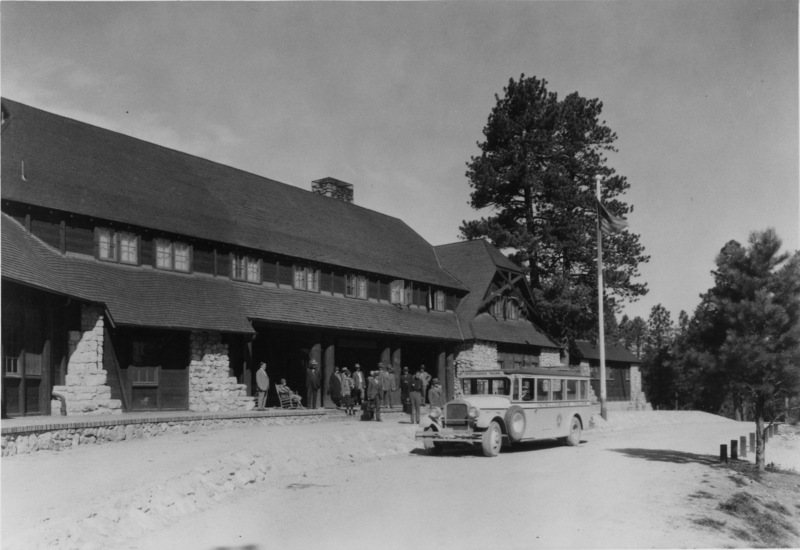 “CCC Camp Now Located at Zion Nat’l. Park,” Iron County Record, August 2, 1934. 1. Wayne K. Hinton, “Getting Along. The Significance of Cooperation in the Development of Zion National Park,” Utah Historical Quarterly (2000): 313. Karl A Larson, “Zion National Park—Park with Some Reminiscences Fifty Years Later,” Utah Historical Quarterly (1969): 408I. David Oswald, A Journey Through Mukuntuweap: The History Of Zion National Park (Scotts Valley: CreateSpace, 2009). J.L. Crawford, Zion National Park: Towers of Stone (Albion Publishing Group, 1988). Zion National Park Museum, “The Diary of Belden Lewis,” 1934-1935. During the spring of 1983, Utah was awakening from one of the wettest winters on record. The previous year saw record precipitation and, in the latter part of 1982, summer rains continued through the fall. Rainfall eventually turned to winter snows and, in the process, saturated the ground beyond its capacity. What was left in the spring was an unusually large snowpack that was waiting to release its moisture down the mountain streams. In normal years the snowpack melts slowly due to air temperatures that gradually warm through late June. This particular season, however, saw a very rapid warm up that created an equally rapid snowmelt and high run-off that overwhelmed local streams, buried a town underwater, and turned streets into rivers. Throughout this record water year, each new storm was adding to a narrative that would become the prominent news story from mid-April through mid-June 1983. This narrative was conveyed through the two local newspapers, The Salt Lake Tribune and the Deseret News, and each story seemed to be a precursor to the subsequent stories that followed. What would follow was a flood that had a lasting impact on Utah’s capital city and northern Utah, in general. This flooding was the result of heavy precipitation that accumulated during the 1981-82 water year, which began in October 1981, and culminated in September 1982. According to Linda Sillitoe in her article, “Floods,” it was a “water year that had broken all records; then September 1982 climaxed with ten times more moisture than normal.” Within this last month of the water year, saturated ground turned to mudslides that closed Big and Little Cottonwood canyons and flooded creeks to the point that the state’s Governor, Scott Matheson, declared a state of emergency, although federal aid was denied. (Sillitoe) September’s floods paled in comparison to what the following spring had to offer. In contrast to the reporting in The Salt Lake Tribune, the Deseret News took the opportunity to report on the impact the slide would have on the last run of the Rio Grande Zephyr, “the nation’s last privately owned, inter-city passenger railroad,” that was scheduled to run on April 24. (Fackrell) Inclusion of this bit of information brought a somewhat personal, or humanistic, approach to the paper’s reporting. It would be nearly a full month after the Spanish Fork slide that the areas located in Salt Lake County felt the brunt of the melting snowpack. Spring storms were still falling on northern Utah throughout May, and by mid-month it was evident that disaster would soon strike Salt Lake City. On May 17, the result of these storms was beginning to show as “the rain and snow filled Red Butte and Emigration Creeks to overflowing and in some areas the bubbling water flowed into curbs and gutters.” (Sorenson) It was the same story in the surrounding suburbs of Salt Lake City, and the nearby towns located in Davis and Utah counties, as the groundwater began to push above ground. Eventually, the rains were reduced to isolated storms, but in their wake the makings of a “worst-case scenario” was brewing. 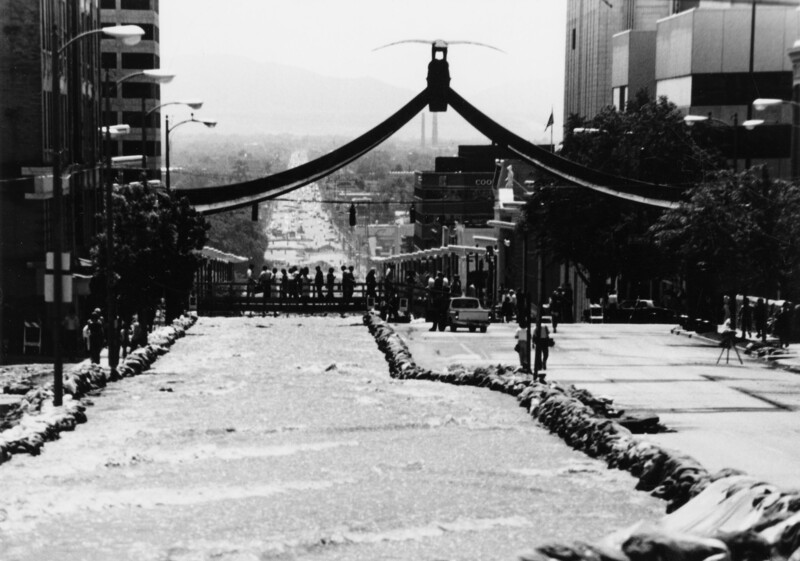 Sandbagging efforts created manmade rivers in Salt Lake City over Memorial Day weekend in 1983. Courtesy of Special Collections, J. Willard Marriott Library, The University of Utah. Water began flowing down the makeshift river on Friday, May 27, between dikes that were seven feet high. The waterway was also extended six blocks eastward to accommodate the overfilled reservoir in Liberty Park. The Deseret News noted that “traffic was snarled … as crews blocked major roads and turned them into rivers.” (Davidson) Around the Salt Lake Valley, the melting snowpack was overfilling the numerous creeks and streams and prompted Salt Lake’s mayor, Ted Wilson, to declare a state of emergency for the city. City and state officials also began pleading with the public to supply volunteers to help with the sandbagging efforts in and around Salt Lake. 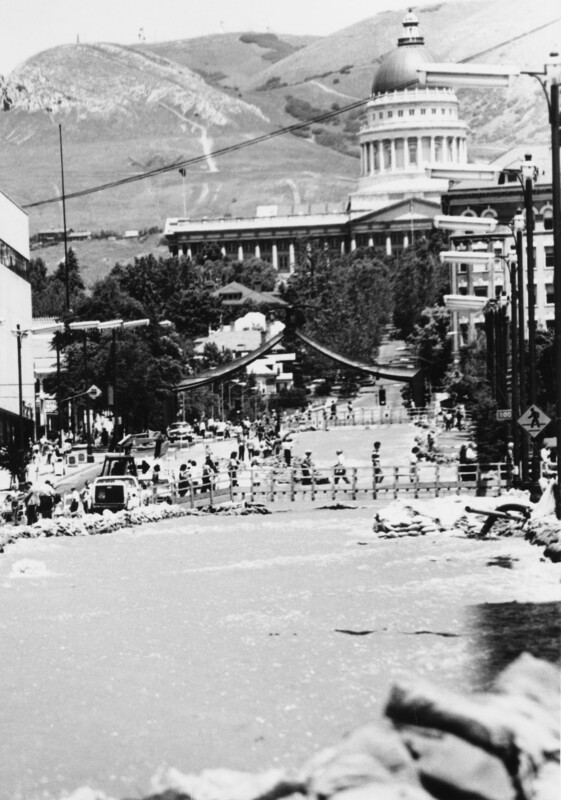 The next day, May 28, in a downtown park known as Memory Grove, water surged over a pond and sent City Creek rushing down both Main Street and State Street. (Ure) It was this event that made the flooding front-page news in the Sunday paper as the water flow from the creek “set a record of 234 cubic feet per second; the old record was 156 feet per second.” ( Ling, Dowell, Pressley) Previously, the coverage of the flooding had been placed in the local sections of both papers, but this changed once the capital city was affected. That night, road crews and volunteers began the construction of a second river to divert City Creek southward down State Street. City Creek flows down State Street as pedestrians cross makeshift bridges. Courtesy of Special Collections, J. Willard Marriott Library, The University of Utah. This festive sentimentality was also evident as the Deseret News attempted to add a little tongue-and-cheek humor to the situation. In its Sunday edition, the paper laid out instructions on “how to turn a street into a canal,” and listed the four necessary ingredients: “thousands of tons of dirt, a multitude of volunteers, a few thousandths of an inch of plastic, and, of course, water.” (Warchol) Already, these rivers in the middle of the city were becoming something of a novelty. In the few weeks to follow, wood bridges were constructed to allow for pedestrians and vehicles to cross the river and linked downtown with Interstate 15. Restaurants also capitalized on the novelty as office workers navigated around the waterways during their lunch hours. (Sillitoe) At times, an occasional fisherman could also be seen casting his lure into the brown waters from one of the bridges. Both The Salt Lake Tribune and the Deseret News built upon this story as it evolved with each storm throughout the spring of 1983. Although television news covered the events, it was the newspapers that really captured the narrative with each article. Television was better able to show the devastation through aerial views, but only once the events took place. The newspapers were able to begin their coverage much earlier. Not only did they report on the events as they happened, they also helped to predict what was to become. Within each weather forecast throughout the spring, the papers gave predictions for air temperatures as well as the effects that the ongoing precipitation would have on future flooding. James Starbuck is a junior at The University of Utah. He is majoring in mass communication with an emphasis in new media and is minoring in arts and technology. Jerrie S. Fackrell, “Crews give on canyon roads, tracks,” Deseret News, April 16, 1983, B1. Ann Shields, “Shifting Mud Clogging Spanish Fork Canyon,” The Salt Lake Tribune, April 16, 1983, B1. Doug Clark, “Mountain Collapse Stops River, Destroys Town,” The Salt Lake Tribune, April 18, 1983, B1. George Raine, “Wall of Debris Holding Water Back,” The Salt Lake Tribune, April 18, 1983, A1. John Ward and Maxine Martz, “Slide turns mountain town into a lake,” Deseret News, April 18, 1983, A1. Doug Clark, “Crews Monitor Streams Rains Threaten Floods,” The Salt Lake Tribune, May 1, 1983, B2. George A. Sorenson, “Storm Provides Flood Control Crews With Preview of Coming Disasters,” The Salt Lake Tribune, May 17, 1983, B1. Lee Davidson, “Crews Turn Streets Into Rivers,” Deseret News, May 27, 1983, B1. “Warm Days Heat Up Utah Flood Battle,” The Salt Lake Tribune, May 27, 1983, B1. Glen Warchol, “How to turn a street into a canal,” Deseret News, May 29, 1983, A6. Jon Ure, “Flooding Erupts From Memory Grove,” The Salt Lake Tribune, May 29, 1983, A1. Ben Ling, Thomas R. Dowell, and Roderick Pressley, “Sandbaggers Turn State Street Into Aqueduct,” The Salt Lake Tribune, May 30, 1983, A1. John Ward and Lee Davidson, “Storms threaten to aggravate flood nightmare,” Deseret News, May 30, 1983, A1. Will Fehr, ed., Spirit of Survival: Utah Floods 1983, Indianapolis, IN: News & Feature Press, 1983.